The transmission of real-time streams over best-effort networks has been an interesting research area for over a decade. An important objective of the research community has been to devise methods that cope with the variations of the network delay -- also called delay jitter -- that are an inherent characteristic of best-effort networks. 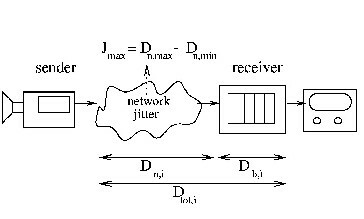 Jitter destroys the temporal relationships between periodically transmitted media units that constitute a real-time media stream, thus hindering the comprehension of the stream. Playout adaptation algorithms undertake the labor of the temporal reconstruction of the stream, which is sometimes referred to as the restoration of its intrastream synchronization quality.